Offers both contemporary and historical cartographies. 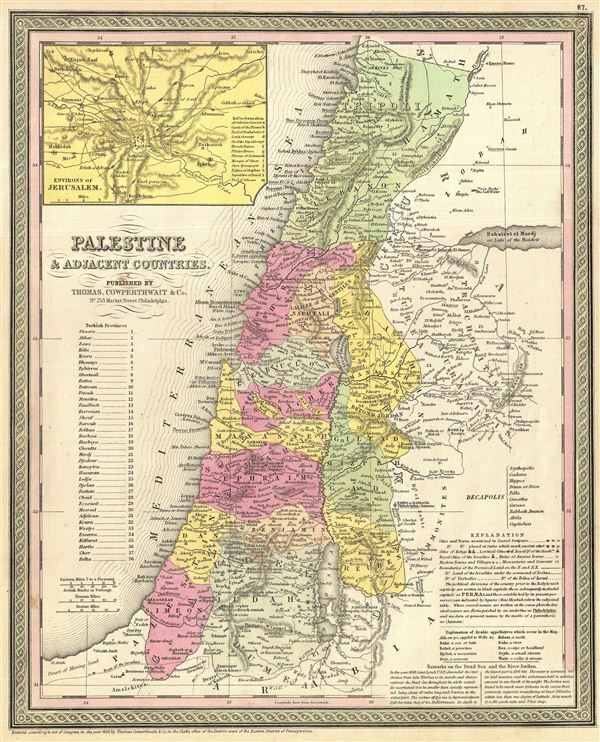 A fine example of Thomas Cowperthwait and S. A. Mitchell's 1854 map of Palestine, Israel, or the Holy Land. This map is a curious combination of a contemporary and a historic map. The color coding details the region as it may have appeared in Biblical times, with the lands claimed by the Tribes of Israel noted. The Ten Cities of the Roman Decapollis are also identified in the lower right. However, it also indicates contemporary place names and offers a table of Turkish or Ottoman Provinces. There is further detailed information about the governmental structure, names of regions and places, and historical notes in the lower right quadrant. The whole is engraved and colored in Mitchell's distinctive style with green border work and vivid pastels. Political and topographical features are noted and color coded with elevation rendered by hachure. Rumsey 0537.072 (1846 edition). Phillips (Atlases) 814.